“I have played on these Viola strings over the last three months. There was a short settling/playing in period. At first, like all modern strings, they were slightly metallic in sound but after the first few hours of practise this was less evident. I particularly like the lower strings’ depth of tone and colours that come through. There was also a noted brightness in the upper registers. I prefer a slightly less bright upper register and had to be sure not to over work the upper strings. The strings are very responsive and do not need to be worked hard. The strings seem to compliment my modern viola well. I play on a 16.5 inch Stanley Kiernoziak viola. (His violas are characterized by their warm tonal qualities with good focus and projection of sound). There was a slight whistling on the D string in the early days of playing these strings in. This was unfortunate but after a couple of weeks was no longer audible. I have performed very different programs on these strings, including orchestral, various chamber music groups as well as my own Sonata recital program. I have been very impressed with the overall responsiveness of the strings in different environments. They are versatile and suit these genres. They project well. On average I get three months out of the set of my usual strings. 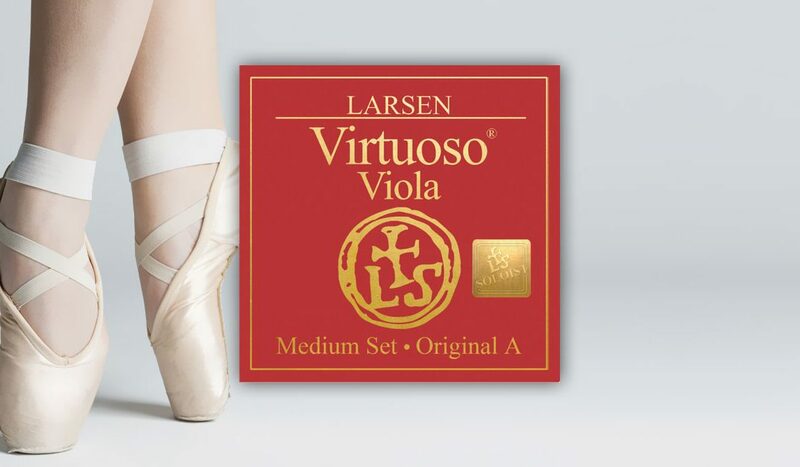 The Larsen Strings are needing to be changed now after three months. Thank you, Michelle, for sharing. Reading through your review, we believe that it could be advantageous for you to combine the Virtuoso Viola Soloist G and C with the medium D and A. This combination should bring a better balance to your instrument.